Logrunners and chowchillas never leave their permanent ranges of 1.7 to 9.8 acres (0.7 to 4 hectares), though they will defend a much larger territory. 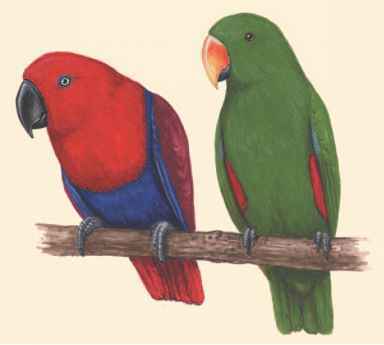 They live with a mate or in small groups of two to five birds. Logrunners and chowchillas have different mating patterns. Logrunners begin nesting in the winter months as early as April and last until November. The chowchilla nests anytime, but July through December is most common. Females of all three species build dome-shaped nests made of twigs, which are topped with dry leaves and moss, and include a roof overhang that keeps the interior nest dry during rainstorms. Chowchilla nests are larger to accommodate their bigger size. Female southern logrunners lay two white eggs. Chowchillas and the New Guinea logrunner lay only one, although only 75 percent of the eggs hatch. Eggs hatch after twenty-one to twenty-five days and chicks remain in the nest for sixteen to eighteen days for the northern logrunner and twenty-two to twenty-seven days for the chowchilla. Females incubate, or sit on the eggs until they hatch. Males bring food to the female, but only she feeds the young. More than one chowchilla male will bring food to the female for the hatchlings. After the fledglings, birds that have grown the feathers needed for flight, leave the nest, they are still fed by both parents. Chowchillas and logrunners have loud calls that can be heard at dawn before the birds begin foraging, searching for food, and at dusk when they are settling down for the night. If they encounter other birds, they will call out as if to remind others of their territory boundaries. These birds are shy and will shriek if startled, but have been known to ignore humans when they feed, walking right over a person's foot as they forage.